At SJF, you’d be supporting passionate staff and volunteers from a wide range of backgrounds as they put their values into action. 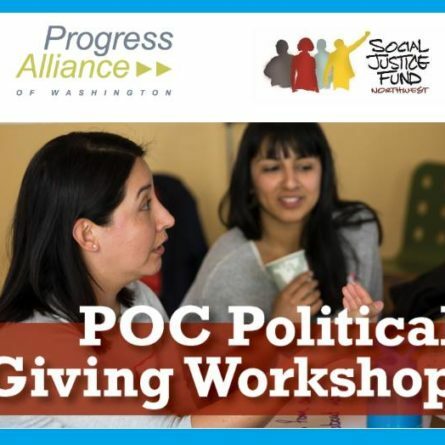 At the same time, you’d be learning about and supporting some of the most amazing grassroots organizing in our region, as you will have the opportunity to use your skills to support the critical work of resourcing community organizing and the broad social justice movement. We strive to live our organizational values of anti-racism, democracy, and transparency. We provide a competitive benefits package (see above for more info). We work to create a family-friendly workplace (including flexible work arrangements and schedules, within reason). We provide support for professional development. The Operations Director will be responsible for the internal operations and health of the organization, with the support of other staff. Social Justice Fund has grown a lot in recent years: we’ve more than doubled our budget over the last seven years, and more than tripled our staff in about the same amount of time. We’ve learned a luot in a short amount of time in dealing with that growth, particularly in the functions covered by this position, and we have a lot more to learn and improve upon. In this position, you would play a key role in getting us to the next level. This position is great for someone who thrives in a dynamic environment, who loves to figure out puzzles, and who loves to see their details connecting to a bigger picture. We’re looking for someone who likes supporting others, who can’t help but notice and then solve problems, and who isn’t afraid to ask for help but can also think critically on their own and adapt to new situations quickly. To perform the job, the employee will be required to communicate clearly in person and electronically with individuals and groups. The employee will be required to read and respond to documents in hard copy and electronic form, and to use a computer and copy/scanner machine. This position will require occasional work at off-site locations, including but not limited to event venues and community spaces. While there is ample opportunity within the organization to travel around our granting region (see introduction) and beyond, this position would not require frequent travel. To learn more about our office environment, click this link here. Please email your cover letter and resume to hr@socialjusticefund.org. This position is open until filled, with priority consideration for applications received by April 30. The ideal start date is from early June to late August. In your cover letter, please be sure to explain why you would like to work at Social Justice Fund and what qualifies you for this particular position. Social Justice Fund NW is an Equal Opportunity Employer. Black people, indigenous people, people of color, LGBTQ individuals, and women are strongly encouraged to apply. We actively recruit, and support the retention and advancement of, persons of diverse backgrounds within the organization. We believe that having a board, staff, and membership with diverse identities and backgrounds enhances our ability to meet our mission and creates a vibrant environment where individuals can learn, grow and thrive. To that end, we are committed to fostering a workplace culture where all employees are equally included, valued, and supported.